When I was but a teenaged car freak few cars held the appeal of the original BMW 8 Series. Introduced in 1989, the 8 Series, specifically the V-12-engined 850s, were truly perceived as the ultimate in Ultimate Driving Machines. Sure, the ruthlessly complicated M70 12-cylinder weighed (approximately) a ton, and the cars were too luxury-oriented; unless you had the super-rare 850CSi, the 8s weren’t exactly sporting. But no matter, as even the eight-cylinder cars were hugely desirable and in tune with the times. What would Gordon Gekko drive? An 8 Series. Duh. At least until the recession of the early 1990s. With the possible exception of the i8, BMW hasn’t had an actual halo car since the OG 8, and I say the brand has suffered as a result. Fast-forward to now: BMW is launching a brand-new 8 Series to try to get some of that swaggering, master-of-the-universe mojo back. Tall order. See, the 4,478-pound (that’s how much the BMW press release says the AWD coupe weighs) elephant in the room is that the new G11 8 Series—like the old 6 Series—is derived from the 5 Series. With the wonderful, awesome, fantastic exception of the M5, I’d take a Honda Accord over a G30 5 Series. Yes, I’m talking about all of them, including the M550i. Ye olde E31 8 Series was a unique platform that BMW spent eight years and $1.5 billion developing. This one? I figured the M850i would be nothing but an M550i with two doors hacked off. And so it was in beautiful Sintra, Portugal, home of the legendary former F1 circuit Estoril, that I approached the 2019 BMW M850i with an always-hopeful heart but a mind full of cynicism. First a road test, then some track time, sure to end in disappointment. Man, was I wrong. Under that bulging hood and behind those wide, snarled nostrils sits the N63B44T3, a 4.4-liter V-8 with two twin-scroll turbochargers sitting in its V. Power is 523 horsepower at 5,500 rpm; torque is 553 lb-ft from 1,800 to 4,600 rpm. All that force is transmitted to all four wheels via the ubiquitous ZF eight-speed automatic transmission. 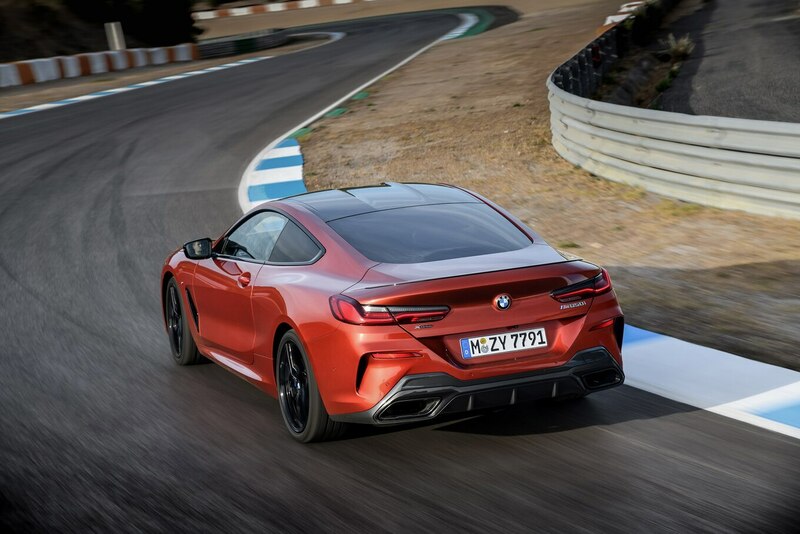 The M850i’s torque split is rear-wheel biased and continuously variable, though under certain conditions as much as 50 percent of the engine’s torque can be sent to the front halfshafts. Most of the time—and largely for efficiency reasons—all the power is routed rearward. All four wheels steer, and all four dampers are electronically adjustable. BMW claims the big rig can reach 60 mph in a super-quick 3.6 seconds. Top speed is cruelly limited to 155 mph. On paper, the stats look good. I dig the way the new 8 Series looks. It’s the first BMW since the 6 Series Gran Coupes that I find genuinely attractive. I’ll add especially in the upcoming 8 Series Gran Coupe form. Hubba hubba! Looking for flaws in the bodywork, one could point to the phony engine vents that are shaped like Batman’s boomerangs, but I don’t mind ’em. The C-pillar has a definite similarity to the current Ford Mustang, especially the way it flows into the M850i’s fat hips. Don’t hate that part, either. In a perfect world, the doors would be longer, and there would be no B-pillar (like the original 8 Series), but overall I find the big coupe handsome, specifically the all-important front three-quarter view. The hard rear’s pretty good, too. The interior is likewise quite nice, quite luxurious, and laid out well. 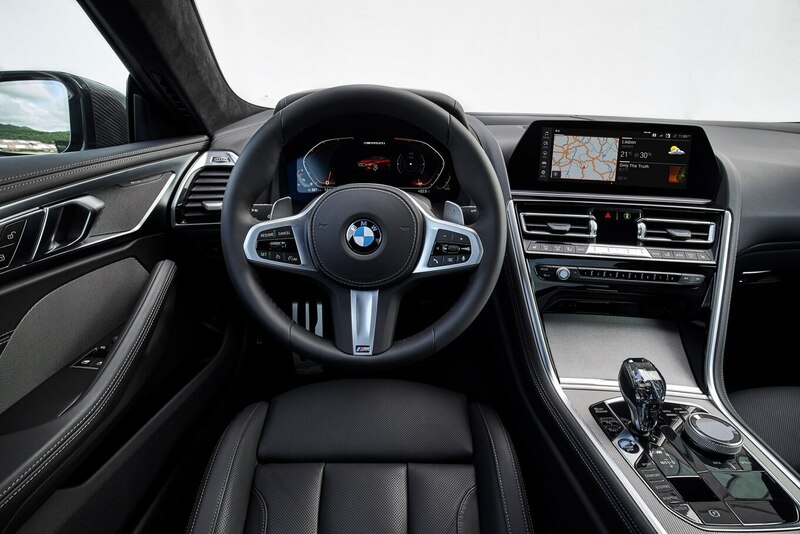 My one gripe is that even though the navigation screen is sharp, legible, and canted toward the driver, the seventh-generation iDrive navigation software is two to four steps backward. On our road loop we missed many turns because we couldn’t decipher what the map was showing us, something that just doesn’t happen in, say, Audis or Mercedes. Android Auto and Apple CarPlay are standard, however, so just Google it. Once comfortable with exploring a bit of Portugal not explicitly mapped out, I began to wonder where the new 8 Series fits into the larger automotive world. The base price of the M850i is $112,885. That’s expensive, about a $22,000 increase over the previous 650i xDrive. The Mercedes-Benz S-Class coupe might seem like the natural competitor, but the S560 4Matic coupe is 5 inches longer, approximately 200 pounds heavier, and, at $125,495, more expensive. 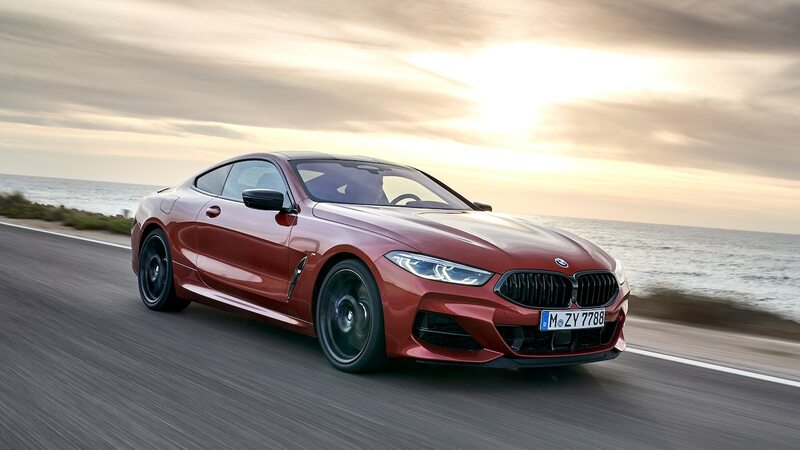 Consumers will naturally cross-shop the two Germans—especially because calling this car an 8 series essentially tricks people into thinking it’s a two-door 7 Series, just like how the S-Class coupe is a two-door S-Class. Only it’s not. It’s based on the 5 Series. To be fair, all BMWs with longitudinally mounted engines are based on the brand’s CLAR “Cluster Architecture.” So if it’s not quite an S-Class coupe competitor, the M850i is most certainly not a rival for the nearly half price, kinda half-baked Mercedes E-Class coupe. Likewise, Audi doesn’t offer up any sort of competitor in the segment. Lexus and the $92,995 LC 500 (the V-8, not the more expensive but quite inferior hybrid LC 500h) is in my mind the big Bimmer’s closest competition. Frankly, unlike that S 560 coupe but quite like the Lexus, the M850i has a definite sportiness baked right into it. That’s the big surprise for me. As I mentioned up top, I was expecting a two-door M550i. Big engine, not much of a chassis, no claim whatsoever to Ultimate Driving Machine. Not even a little. Well, I was shocked at how well the M850i tore down the road. Was I worried about the weight? Yes. Were my worries unfounded? Also yes. I think when future car fans look back on the biggest performance innovations from the mid-teens, four-wheel steering will be high up on the list. The tech finally works properly, and in the case of this BMW, it takes a large car and allows it to drive like a medium one. The steering is admirably precise, and more important—and this next part is a departure from BMWs dating back a decade or so—the steering feel is right on. The wheel is not artificially heavy or boosted or dead or variable or any of the other dreadful descriptors I’ve had to use over and over again since the Bangle cars appeared on the scene. The new M5 is the first BMW in a long time with pretty good steering feel, and the M850i continues the trend. Does the car provide Porsche-like waves of feedback through the tiller? No, but frankly neither do modern Porsches. It was fun to smash this big guy around. Its 553 lb-ft of torque plus all-wheel drive means that the M850i launches good and hard. Do I have reason to doubt 60 mph comes up in only 3.6 seconds? Nope. 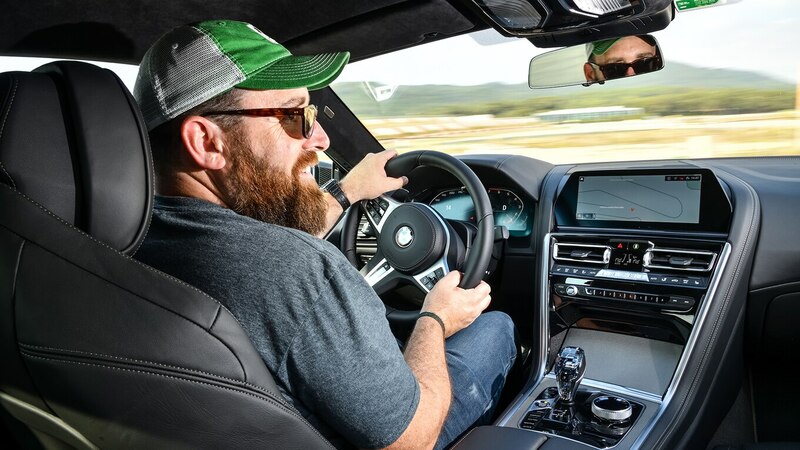 The engine keeps pushing and shoving, and the torque moves the 8 Series down the road with authority—an authority that’s not unlike the traditional feel of a Bentley, one where the heft is a good, positive part of the driving experience. All that’s just a fancy way of saying strong; the M850i feels strong. The transmission is programmed about as well as I’ve seen, so much so that I never even had the notion to start pulling the paddles. What’s the mark of a great automatic transmission? When you don’t even think about it. If there’s a sore spot driving-wise on the street, it’s the brakes. BMW opted for brake-by-wire in the 8 Series—can’t have autonomous vehicles without it—but like most systems, these brakes were overly grabby at low speeds and difficult to modulate. I assumed that once we got to freshly repaved tarmac on Estoril, the brakes would be even worse. Wrong again, Jonny. 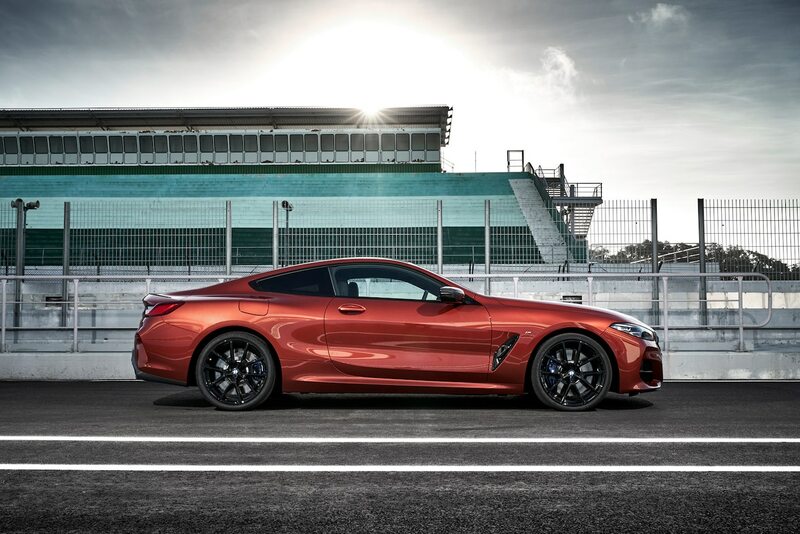 All of the gathered journalists agreed that no one takes cars like the M850i on the track. First of all, an honest to goodness M8 is coming, and second, they just don’t. But they should! What a surprisingly fun car to hoon around a track! With both the car and the traction control in Sport, I enjoyed some of the most giggle-filled laps in recent memory. The rear-bias of the AWD system allows you to hang the rear end out all over the place, but it then smartly feeds just enough power back to the front tires to help pull you around a corner. Sadly, the way press launches work these days, you go out, you get your laps, and that’s it. I say sadly because I was so impressed by how well the M850i did in Sport mode that I forgot to bother checking out Sport Plus. Moreover, I failed to experience what it was like with traction control turned all the way off. I will say, DSC Sport (BMW-speak for traction control) lets you dial up pretty big slip angles before the nanny takes over and reels you back in. The brakes? They worked better on the track than on the street and had no issues like fade even after repeatedly hauling more than 4,500 pounds down from over 150 mph. Moreover, I wasn’t working all that hard. As Randy Pobst often says, good race cars are easy to drive. That’s certainly the case with the M850i on track. Little is better than having your preconceived notions proven wrong by a great car. Where I was expecting a disappointing driving experience, I was treated to a wonderful one. Assuming frowns, I instead experience smiles. Great big ones. Don’t think of the M850i as a two-door M550i. Think of it instead as a lightly detuned M5 with a tight rear seat but much sexier sheetmetal. I’ll even go so far as to say this: The M850i xDrive is a worthy successor to the original 8 Series. Like the original, I say the 8 Series sits at a unique place in the market, has enough curb appeal to turn all the right heads, and can surprisingly put its performance money where its mouth is. The post 2019 BMW M850i xDrive First Drive: The Joy of Being Surprised appeared first on Motor Trend.